There is that incredible sense of forlorn when you look at the polaroids, presented by the artist, of old cinemas in Singapore and Malaysia. The feeling you get, looking at the National Library one last glance, or seeing it in pictures and thinking about the tunnel that sits at its present site. These old cinemas, some jilted, some disused or some derelict suggests the side-effects of consumerism and mass culture. Run down just isn’t strong enough to describe them. Grief, or sadness would probably be better. The work isn’t as overwhelming or cinematic as Cinema Paradiso (1988), directed by Giuseppe Tornatore where one grows out of dreams; instead, we are both drawn towards these strange buildings that once promised dreams and more, but kept away by the small print size of the polaroid, unable to see details, unable to remember. The artist is successful here, to make such buildings interesting again by placing them as a set, a historical survey of the cinemas’ histories more than facebook could ever do credit, by setting the series in the arts house, and accompanied by Popular pastiche of movie posters and film stills, ridden by the artist persona, adapting, appropriating and reliving. It reminds us of the importance of sentimentality, like movies do, nostalgia like your old class photos, and the cruel pragmatism of capitalism – if it doesn’t make money, it should go. Filem-Filem-Filem is an exhibition of photos, prints and videos inspired by Ming’s search for old cinemas in Singapore and Malaysia, commissioned for the Singapore Fringe Festival 2008. It was last shown at the Arts House in Jan 2008. 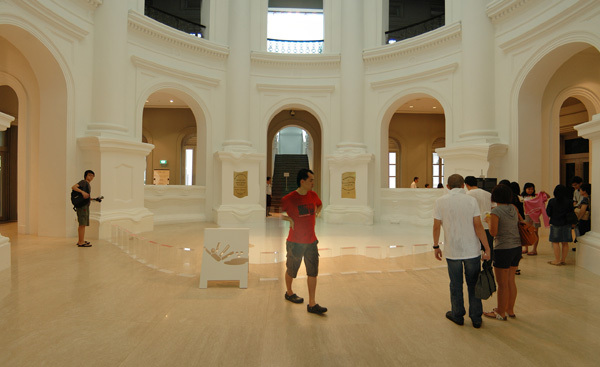 The recent of body of work is really a culmination of the piece, Delusion (‘splatter’), last shown at the National Museum of Singapore rotunda lobby, and his earlier painted, stretched vinyl canvas light boxes. 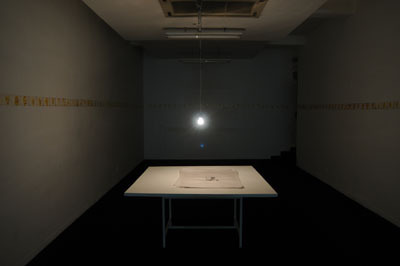 The works can be divided into 4 categories: painted splatter on canvas, resembling Boo Sze Yang’s suggestive but blurred paintings; printed silkscreen splatter-shape on paper, framed; giant splatter shaped, laser-cut aluminum with cable lights; and vinyl light boxes with ‘air-brushed’ splatter. While the fancy title is as illusionary, and seemingly a linguistical farce, it does question other issues, such as art and illusion, a study in the psychology of pictorial representation, as argued by renown art historian Sir E. H. Gombrich. There are examples of extreme pastiche in Chew’s body of work, that can best be described as mix and match, across 2 or more cultural divides. For example, in the first category of work, resembling Singapore artist Boo Sze Yang’s suggestive but blurred paintings, obscuring the background with a distinct foreground. The blurred nebula background immediately suggest the possibility of the silhouette being a mecha, a short-form of the phrase “Mechanised Robot” in Japanese, from popular anime series. The printed silkscreen splatter-shape on paper, could remind one of artist Bridget Riley’s op art like pattern paintings, difficult to pin down, but lifted ever so slightly from the surface to create an optical drop shadow. 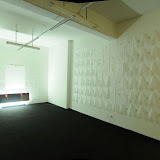 The laser-cut aluminum with cable lights, could be a progression from minimalist traditions of American artists Donald Judd, or Dan Flavin, playing with industrial processes and readymades to produce a kind of ‘hybrid painting’ that is hung on the wall, negating the history of painting. So unless one is ready to question the psychology of pictorial representation, playing with the thought that the splatter could be a super mecha from outer space, the success and critical position of the exhibition would remain a delusion. pictures declined to given for this review with sincere apologies. silhouette |ˌsiloōˈet|nounthe dark shape and outline of someone or something visible against a lighter background, esp. in dim light. • a representation of someone or something showing the shape and outline only, typically colored in solid black. delusion |diˈloō zh ən|nounan idiosyncratic belief or impression that is firmly maintained despite being contradicted by what is generally accepted as reality or rational argument, typically a symptom of mental disorder : the delusion of being watched. • the action of deluding someone or the state of being deluded : what a capacity television has for delusion. It is peculiar that tracings of photographs can have such a tremendous effect on you as you stare at the walls filled with them. They are overwhelmingly sad, perhaps because of the mood the work seems to convey, not unlike a columbarium with rows upon rows of tiny portraits staring at you. I counted 80 (15 x 4 rows) such delicate ‘tracings’ and ‘prints’ of children’s portraits, on each of the two walls, flapping ever so slightly, flanking a large tracing paper. This centre piece consists of piercings, almost making the image of a man invisible. At a certain angle, it resembles an unknown constellation, with light peering through the pin holes, eager to surprise, eager to form something. The overwhelming white light from the window, contrasts greatly against the yellow incandescent light bulbs that hang precariously. The works by Susie Wong reflect a continuation from her Master Degree Show piece at LASALLE College of the Arts, exploring the practice of ‘tracing’ in both sense of the word – distilling the act of drawing to an act of tracing, following the mind’s imaginary track with a pencil in hand; leaving a mark or stain, by any means on paper. In the context of the exhibition, a third meaning could be extracted from the title ‘trace’, that of tracking with the intention of investigating these portraits. The second meaning of ‘leaving a mark’ is particularly relevant here, seen in the dichotomies drawing can offer. Additive, leaving a mark seen in the pieces in the front gallery, and reductive, scratching photographs seen in the back of the gallery. While there is a certain semblance to the ethically controversial works of Christian Boltanski, which are enigmatic and haunted by the problems of death, memory and loss, Wong’s work seems less contrived. The subjects of the photographs and ‘tracing’ prints are most certainly related to the artist. For example, the exhibition text reveals that the girl, Anmari, in the piece where the artist repeated ‘traces’ the image several times over is actually the artist’s daughter. It reminded me of a mother’s constant additive attention to her child, much like the act of tracing something repeatedly, giving over and over again, selflessly. The title of the tracing and scratched photographs are named uncannily 42. It happens to be a numeric solution to the “Answer to Life, the Universe, and Everything” in Douglas Adams’ book, The Hitchhiker’s Guide to the Galaxy. While the use of numerology eludes me here, it is almost equally baffling why it needs to mean something. These reductive photographs are more haunting, and lingering, revealing only hollowed eyes and mouth, while the rest are erased by reductive, destructive scratches. The installation is perhaps a record of a process of remembering, tracing repeatedly one’s thoughts and feelings of people close to the artist. The scratches then, perhaps are the fallible memories we have with age. It feels like a doomed exercise, with each new tracing, something is lost, new smudges appear and something is altered. We can never copy an image perfectly, but with each imperfection introduced, we are reminded that we are but human, and there are more things in life then trying to copy something blindly. A title as suggestive as A Day Without Trees, is as apocalyptic as the movie The Day After Tomorrow (directed by Roland Emmerich, 2004). The transformation is subtle, except for the pool of white liquid on the floor. The artist has chosen to ‘melt’ the plinths and brass plaque commemorating the opening of the museum, like marsh mellows under the hot sun. This melting is surreal, frozen in the moment, or moving immeasurable slow to the human eye. The building is in an inextricable situation, doomed to perish. This site specific exhibition is interesting, beyond the context of the popular, and real issue of Global Warming (for more information on Global Warming, check out www.climatecrisis.net). Melting the museum from within, could be interpreted as the collapse of the traditional roles of the Museums, to be replaced by Andre Malraux’s concept of museum without walls, without barriers or even physical structure. The national museum is certainly such a site, curating and displaying contemporary art, as markers of history. This not only rivals the Singapore Art Museum for contemporaneity, but surpasses it in its engagement with architecture and virtual web space. 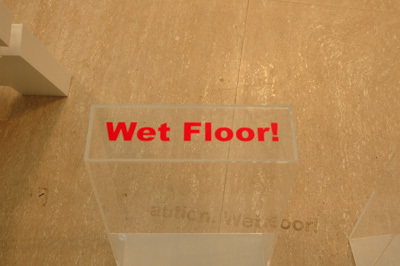 Unknown to many, the site specific installation has ‘morphed’ at least once, with the addition of clear acrylic boxes, labeled on top with the text such as ‘wet floor’, ‘spill’, ‘closed for mopping’, presumably to prevent viewers from stepping on the white latex. There are other subtle modifications, such as pools of water, a trademark of the sculptor Yeo Chee Kiong, just skimming the surface of the plinths surrounding the rotunda. Sadly, this portion of work is maintenance heavy, and not always brimming. The water surfaces possibly inspired by British artist Richard Wilson’s 20:5o, are frills and idiosyncrasies of the artist, adding to the surrealism. The acrylic boxed signs, sadly dramatically changes the mood of the work from something serious to frivolous. It is almost like putting comic fonts on police vehicles. I would have preferred something more conventional, such as a plaster-cast pail with mop, and a real plaster-cast wet floor sign, making the link to sculpture more palpable to the public. 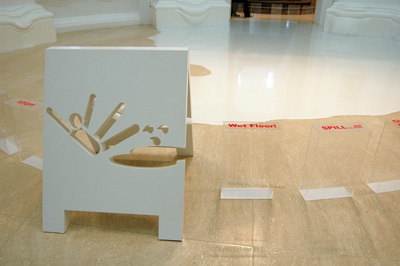 Clear acrylic boxes, replacing vinyl stickers on the floor, are meant to allow the viewer to still see the work and to block human traffic; even a sign that says “molten liquid will stain your shoes”, in 4 languages in a deadpan fashion might be more effective and less distracting. The pseudo designer wet floor sign is too difficult to read for many, especially in that lighting condition. Despite the criticism one may have for the unnatural barricades, the raison d’être of the work is admirable, and timely with the United Nations Climate Change Conference, in Bali from 3 – 14 of December, 2007. For the sculptural intervention of the rotunda, the first rate construction over parts of a conservation building, the artist gets two thumbs up. To many, the seriousness of identity, and cultural heritage are not to be ridiculed. But the fact is, learning to ‘take a piss at oneself’ is really transcendental, and tests one’s limits and believes of an open mind. By stepping out of oneself, often allows a deeper insight into who we are. Art, at the heart of culture, may be the best meeting place for the ridiculous, lame ideas and serious, harsh reality. The works in the clever exhibition can best be described as ticklish, some more provoking then others; some more baffling or lame. While one’s amusement may depend on one’s understanding the artists’ wider practices, the exhibition catalogue supercedes in strength and clarity then the actual arrangement and presentation of the works. The works by the same artist were split to suit the space, creating an uneasy juxtaposition of very different concepts, in too much space. For example, when you compare Chen Yi-Cheng’s “Feel Free to Donate Towards the Artist Integrity Fun”, and Cheo Chai Hiang’s “Ling Xiu”. Instead of enhancing each other, it made Chen’s piece very dislocated, and outright tacky, but not kitsch enough to fill the space. The catalogue reveals the curator’s earnest, segmented discourse in laughter and humour and it’s unique position in our culture. He then delves into the individual works on exhibit, teasing it’s relationship to the theme of the exhibition. Not only does this provide a description of the work, it allows the reader to understand the intention of the artist and how the works possibly relate to each other conceptually. Visually, the exhibition is too tamed, and clinical, perhaps a diliberate contrast to the puns. Some works pale because of scale and intensity of engagement with the theme, others are more successful as a series. Particularly striking, is Chua Aik Boon’s erasure of prominent buildings in his digital printed panoramas. Can you spot the missing Substation from the Armenian Street panorama? Maybe what the viewer needs is an audio guide with canned laughter, an empty room to trick the viewer, creating a tighter space for some of the works, and/or heavily armed security to warn visitors that smiling or laughing is strictly prohibited.